The Wolves host the Niagara IceDogs Sunday afternoon for a big divisional match-up. It was a packed house as it was Superhero Jersey day in support of the NEO Kids Foundation. 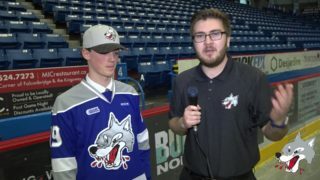 The Superhero jerseys powered the Wolves to make a comeback push from a four-goal deficit, but they could not overcome a flat first period as the IceDogs managed to hold on to their lead, winning by a 5-4 final. The IceDogs were the better team for most of the first period out-shooting the Wolves 24-8. 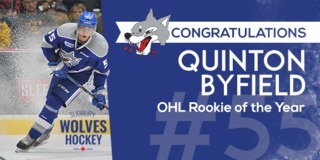 Three minor penalties for the Wolves allowed the IceDogs to gain the momentum. Aaron Haydon beat Jake McGrath to put the IceDogs up 1-0. Haydon’s goal was the lone goal of the period as the Wolves went into the dressing room down by 1. An onslaught of goals in the second period started just two minutes into the frame with a goal from the IceDogs’ Justin Brack. 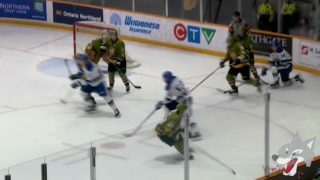 36 seconds later, Ondrej Machala beat McGrath five-hole to make it 3-0 for the IceDogs. Following the third IceDogs goal, Mackenzie Savard replaced McGrath in net. The goals kept coming as Karill Maksimov scored to extend the IceDogs lead to 4-0. Michael Pezzetta put the Wolves on the board, but the celebration did not last long as seconds later the IceDogs responded. Macauley Carson scored next for the Wolves as he put a bouncing puck into the net to cut the lead to 5-2. The Wolves outshot the IceDogs 15-11 in the second period. In the third period, the Wolves continued to build off of the momentum gained from the end of the second period as Carson scored 2:41 seconds in. 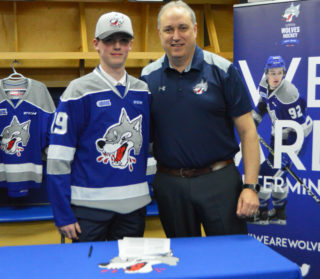 Back-to-back minor penalties to the IceDogs allowed the Wolves a major opportunity on a five on three that they took full advantage of. 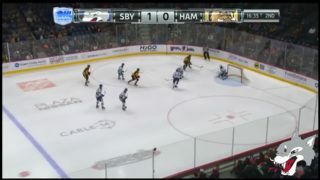 Dmitry Sokolov scored a beautiful goal from the point to put the Wolves within one. The goal marked Sokolov’s 40th of the season. The fans were the loudest they have been all season with Go Wolves Go chants echoing throughout the arena. Despite a hard push at the end of the game, the Wolves could not overcome the IceDogs as they fell by a 5-4 final. Final shots on goal were 43-39 in favour of the Wolves. 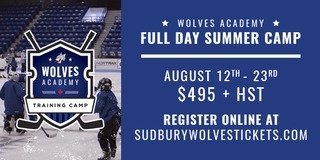 The Wolves will head on the road Monday as they travel to Peterborough for a Family Day match-up at 2pm. They will return home next weekend to host back-to-back contests against the Barrie Colts on Friday night and the Mississauga Steelheads on Saturday night. Puck drop is 7pm for both games. Saturday is Vale Sudbury Saturday Night.